FIRE-SAFE OR SCALPED? : Zealous fire fuel reduction efforts in Cambria's Monterey pine forest are upsetting some residents who worry about the future of the forest and its wildlife. Pictured is two sides of the same Cambria road, one cleared of undergrowth. # fire in Cambria has ignited a blazing controversy in the coastal forest community. 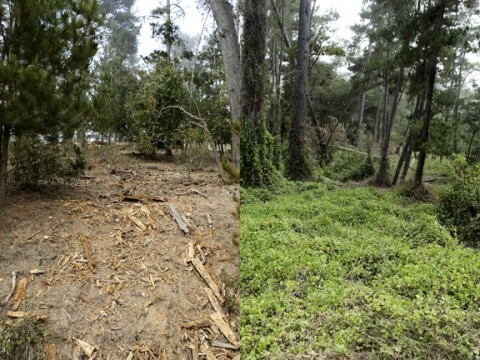 Some local residents are charging that enacting the so-called Defensible Space Ordinance would doom the rare Monterey pine forest it's designed to protect, while other property owners have already taken steps to remove the natural forest understory vegetation and cut trees. "It's more than just 'defensible space.' Things have just been scalped on vacant lots, as if we already had the ordinance. The trees look like lollipops. It's changed the community a lot," said Doug Buckmaster, a Cambria resident and long-time activist. Cambria Fire Chief Bob Putney and the Cambria Community Services District have written a draft ordinance that would require property owners to annually clear all "brush, ornamental vegetation, native and non-native species that look like brush" and to remove all tree limbs up to at least six feet from the ground. The new ordinance would replace the community's current Fire Hazard Fuel Reduction program, a weed abatement process that requires advertising, public hearings, and other steps termed by Chief Putney as "costly, cumbersome, and labor intensive." He and the district mailed out a notice to 2,000 lot owners this spring to inform them of the requirement to reduce vegetation and downed trees that act as fuel for fires. "They confused everybody by putting out that mailer, with the pressure of fines. Everybody panicked," said Rick Hawley, executive director of Greenspace-the Cambria Land Trust. He's a member of the SLO County Community FireSafe Council who has trained local vegetation workers about native plants and invasive species. "Some of the vegetation workers have the same confusion, and a lot are not trained," Hawley added. Even more worrisome, he said, is the "huge amount of vegetation" being removed from the forest, eliminating the natural cover needed by deer and other wildlife. "We're looking at a future with not a single native plant left. It will be the death knell for the forest," he said. "I'm 100 percent for defensible space, but it doesn't require making a putting green around your house. You can leave clumps of vegetation to protect animals and birds from predators. You can have snags, which are an important part of the environment. And you can leave dead wood on the ground, which is extremely important to the forest as part of the carbon cycle. "That's all gone in this ordinance." Capt. William Hollingsworth of the Cambria Fire Department said that typically "defensible space" relates to structures, rather than vacant parcels, but the new ordinance would cover both in "one much larger program." The fire captain noted, "You have to have a balance. Some contractors are more of a mind to cut everything, while others go in with a pair of shears. Neither is appropriate." The Land Conservancy of San Luis Obispo County also supports the idea of balance, according to its conservation director, Bob Hill, who's been working for years to buy Cambria lots to protect the forest on behalf of the nonprofit group. "We need to find that balance that ensures forest health and integrity over the long term, and has reasonable fire protection as well. It's a high wire act," Hill said. Chief Putney noted that some vegetation workers have cleared lots "not according to our specifications," adding, "People often blame us. People are concerned that we're trying to shave the hillsides, but we don't want to see the environment of Cambria degraded more than it already is." He pointed out that a fire in Cambria would be "tremendously bad" for residents, many of whom are older people who might have difficulty escaping. Cambria is currently rated as having a "moderate" fire severity risk by both CalFire and SLO County, but may soon see a "high" rating. A public hearing on a new rating for Cambria and other parts of the county is scheduled by CalFire for July 12 at 1 p.m. at the SLO Vets Hall, Putney said. Cambria Forest Committee member Tim O'Keefe, a Cal Poly emeritus professor of forestry, said rather than a one-size-fits-all approach for Cambria's fire management, he'd rather see a provision for a mosaic of cut and uncut areas to provide habitat for wildlife. "Fuel reduction is essential, but you'll never totally eliminate fire," he said. "Southern California's whole ecology is geared to fire, whether we want to acknowledge that or not. Carefully done, fuel reduction can improve the health of the forest. "Some lots have definitely been overcut. That's a panic reaction, not good fire management," O'Keefe said. He suggested implementing a special fee for Cambria property owners as Monterey has done to cover professional fuel reduction and a staff forester. "Good fire management requires an investment. You can pay now, or wait till your house burns down and pay for that," O'Keefe said. The Cambria Community Services District board of directors has decided to refer the draft ordinance to the Cambria Forest Committee for more input. Chief Putney said he hopes a new ordinance will be in place in time for next year's fire season, adding, "Relax, folks. It's a very, very rough draft. Yes, it needs work. It is a balancing act."